Terry Pratchett is an award-winning English novelist known for his work in the comic fantasy genre, most notably the Discworld series. The Discworld is a realm in which the world is flat, balanced on the backs of four elephants all of which are also balanced on the back of a giant turtle. Did I mention he has the delightful ability to throw in a strong element of whimsy and humor into his work? In Socratic Theatre Collective‘s Fringe offering Mort, the cast invite you to enter the Discworld where anything can happen. In this story we are introduced to Mort (Dave Heppenstall), short for Mortimer, a dorkishly endearing young man who’s rather timid and looking for his first job. Only problem is, no one wants to take him on. That is until a dark figure, cloaked in black, carrying a scythe and appearing rather skeletal decides to apprentice the young lad. This dark figure is Death (Basel Daoud) and when you spend your years escorting mortals to the Underworld your household can get rather lonely, and your (adopted) daughter Ysabell (Liz Bragg) can start getting on your nerves. Wouldn’t it be nice to find someone that can allow you to take a day off? But humans have a tendency to feel compassion for other humans and try to step in to balance the scales which Death never does. And for a young man on his first job, he tends to slack off wandering away to talk to wizards (Cutwell the Wizard played by Lorne Mandelzys) or watch pretty princesses (Princess Keli played by Vanessa Graymason). And when Death decides to leaven Mort in charge for a day, reality can undo itself. 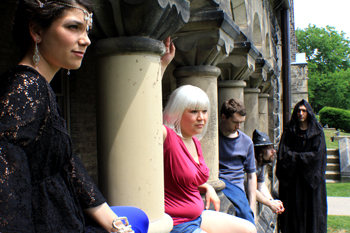 This site-specific show (University College Quadrangle) adds atmosphere to the show, situated outside surrounded by the old world picturesque buildings of the University of Toronto. And yes you are outside for the duration of this 90 minute show, keep that in mind to bring a blanket or a lawn chair, water, snacks if you wish, and sunglasses. The performance plays out around you so you’ll have to turn around to catch all the action. I suggest standing and walking around to get a closer view. Being outdoors means sound can travel and it may be hard to hear all the dialogue unless you get closer. Just be mindful of other people and cast members who may need to walk through the crowd. There are laughs to be had throughout the show, even if it’s just a chuckle here and there. The acting is superb. Cheers to Basel Daoud who delivers Death with such deadpan (excuse the pun) humor and an almost stoic confusion when he tries to understand humans’ preoccupation with “fun”. And more praise to Dave Heppenstall as his Mort really is endearing, dorky, lovable and you can’t help but feel for him throughout his disastrous ordeal. There are other moments where the acting and dialogue can seem over the top and highly exaggerated, I’m not sure if this is to compensate for sound travelling outdoors. All in all, Terry Pratchett’s Mort is a delight to watch and gives the chance to see the beauteous U of T buildings if you haven’t had the chance to explore the campus. Worth a watch while you’re exploring Fringe. Terry Pratchett’s Mort plays at Venue 22 University College Quadrangle (15 Kings College Circle). Show times are: July 13 at 7:00 pm, July 14 at 7:00 pm, and July 15 at 2:00 pm. , Liz Bragg, Dave Heppenstall, Lorne Mandelzys, and Basel Daoud by Johnathan East.